My grandparents weren't familiar with the german shepperd dog until one day one adult male showed up at their doorstep. They of course were frightened at first but he continued to hang around as long as they fed him. He soon became ours for many reasons but the one main reason is why I am writing this little story. Living on the side of a mountain you can imagine how steep the stairs to the front door were. We had a small deck at the landing of the stairs and during one of my brothers roaming tot days he decided to explore the deck that was approximately 30 feet above ground. Well, Shep, saw him on the deck and somehow knew to go get my grandma and run back too catch my brother by the arm just as he was about to go over the side of the deck! Needless to say, Shep, as he was lovingly called, had a permanent forever home from then on, no questions asked. He was our hero. He died years later, but after a long life of heroic endeavors. 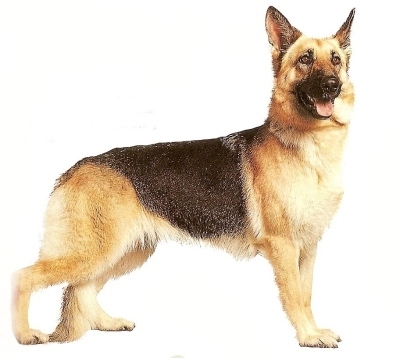 He was the first in the long line of german shepherds we have . I wouldn't have another breed. They are special, loyal and become part of the family, we didn't find Shep, he found us.Miss you, boy! !